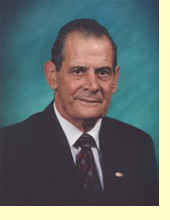 Joseph Lopez, better known as "Joe" to all his friends, was born to Clemire and Elda Poirrier Lopez on December 14, 1931, one of twelve children. Seven months after marriage, Joe was drafted into the U.S. Army during the Korean War, where he served his country for eighteen (18) months. Joe learned basics of playing the fiddle at New Iberia Senior High School when he was sixteen years old. Once he mastered the basics, he started playing Cajun music by ear. The first song he learned to play was "Cher Toot Toot". From there he practiced and learned more songs until he felt he was accomplished enough to play with a band in the dance halls. The first band Joe joined was "Tee Denise and the Iberia Playboys." Joe spent the next ten years of his musical career with Mr. Elias Badeaux and his band, "Badeaux and the Louisiana Aces." Together they played throughout Louisiana and also had the opportunity to bring Cajun music to Washington D.C. They recorded several songs, including the now famous "The Back Door" and "The Jolly Rogers Waltz," which were written by fellow band member and featured vocalist D.L. Menard. As with all Cajun musicians, Joe had a real full time job with Morton Salt Company. His job duties required shift work disrupting his music career, so Joe chose to quit the band but keep his full time paying job. Joe couldn't go without music for long so he joined with the "Touchet Brothers." Joe started as the rhythm guitar player and later played twin fiddle with Willis Touchet which gave the band a unique and popular sound. Joe would again have the opportunity to be recorded with the Touchet Brothers staying with them for several years. In 1995, Joe and his wife were involved in a serious automobile accident which nearly took both there lives. Joe was in a coma and intensive care nearly two weeks. It took nearly six months for Joe to recover from the accident to a point where he was able to play music again. As faith would have it, this was like a new beginning for Joe. He was contacted by the King of Cajun Music, Aldus Roger, who happened to be looking for a new fiddle player. Aldus had long admired Joe's playing style and wanted it for his band. At one of the bands first dances, with Joe playing the fiddle, Aldus introduced Joe to the audience saying "the fiddle player I had before was good but now I've got one of the best." Joe went on to record a CD with Aldus Roger and The Lafayette Playboys on which he was featured on the recording of "The KLFY Waltz" and "The Miseres of The Balfa." Joe was still playing with the band when Aldus Roger passed away. After leaving the band, Joe joined up with Jr. Flores and the Bayou Boys, later starting his own band Joe Lopez, Danny Mire and The Cajun Kani. Today Joe still plays with Ulysse Poirrier and The Bayou Teche Cajun Band as well as giving of his spare time to play with Deno Boudreaux at local nursing homes. He is frequently called upon by various bands to stand in when they need a fiddle player. Joe has played with many of our upcoming new and young talents and is always willing to offer his guidance and experience to them. In the year 2000, Joe was the recipient of the Pioneer Award from the CFMA for promoting our culture. In 2001, Les Cadien's of the Teche recognized and awarded Joe for promoting and preserving Cajun French Music. He is married to Dorita Bonin. They have been married for fifty-one years. Together they have five children, fourteen grandchildren and eight great grandchildren.